Edward Grimshaw and Mary Ann Heywood were married at St Mary Church, Oldham, Lancashire on October 9, 1881. Oldham is located northwest of Manchester. 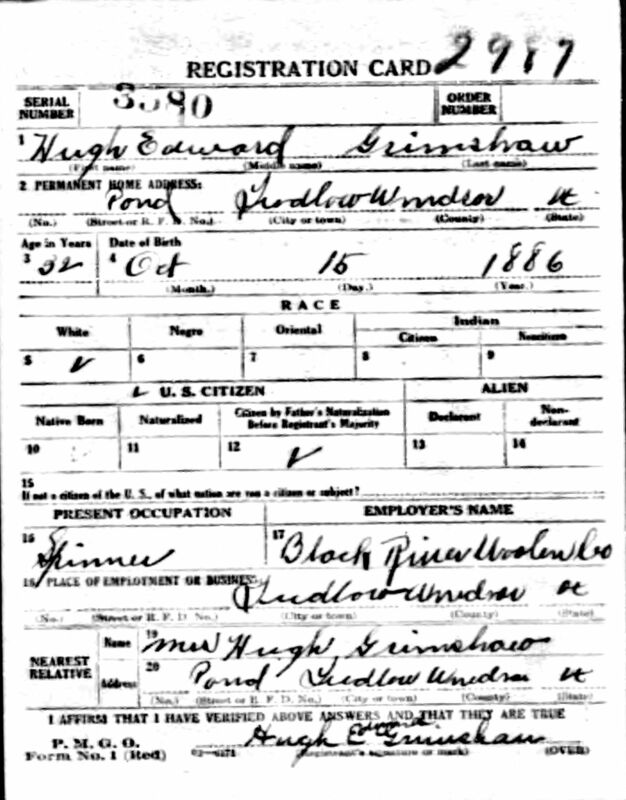 Their son, Hugh Edward Grimshaw, was born in Manchester on October 15, 1886 (possibly 1888), and the family apparently emigrated to the U.S. in about 1888. Hugh Grimshaw married Francis Gates Stockwell in Cavendish, Vermont, on February 1, 1913, and they apparently had two children, Helen Mary (born October 3, 1914) and Norman (born March 5, 1919) Grimshaw. Because Vermont has kept excellent vital statistics documentation, most of the essential records are readily available for the family. Edward Grimshaw’s ancestry has been documented back seven generations to James and Elizabeth (Guest) Grimshaw. James was a member one of the Prestwich Grimshaw family lines, which are described on a companionwebpage. Note the 1886 birthdate on WWI, which changed to 1888 on WWII card. 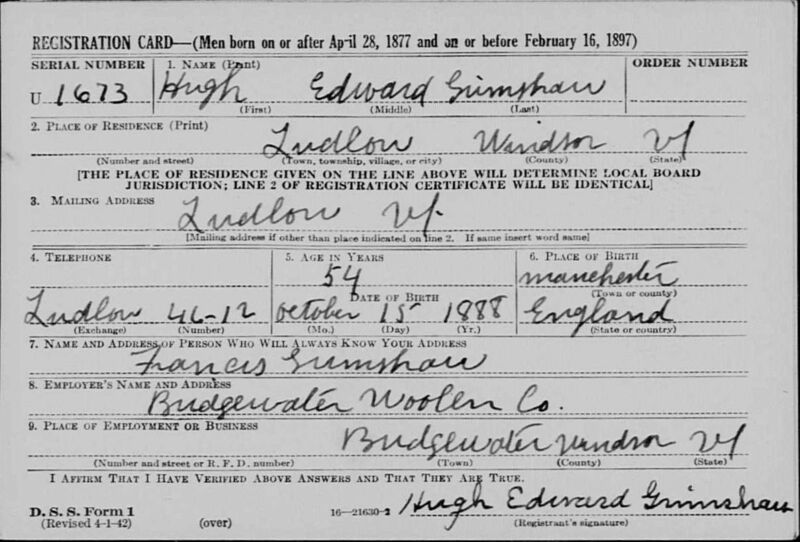 Other records indicate that 1886 is the correct date, based on when Edward and Mary Ann Grimshaw immigrated to Vermont. Norman “Bud” Grimshaw, 93, of Rutland died Monday, August 20, 2012, at Rutland Regional Medical Center, after a brief illness. He was born in Ludlow on March 5, 1919, the son of Hugh and Frances (Gates) Grimshaw. He was a 1937 graduate of Black River Academy. Three years later, he was mobilized for service to his country in World War II. He was a platoon leader with an anti-tank company. While with the 83rd Division (infantry), he saw action on Normandy Beach, the Hertgen Forest, Belgium, Northern France and the Battle of the Bulge. During this service, he received the Bronze Star with three oak clusters. He was discharged in 1946 as a first lieutenant. In 1948, Bud and his partner built and operated the Rutland Drive-in-Theater, the first in the state. In 1950, he was called back into service during the Korean War, serving two years. Norman retired from the National Guard with the rank of major in 1962. He also retired from the U.S. Postal Service in 1979. Bud was a longtime member of the Proctor-Pittsford Country Club. He also liked classic cars and was a member of Rutland Area Vehicle Enthusiasts (RAVE). 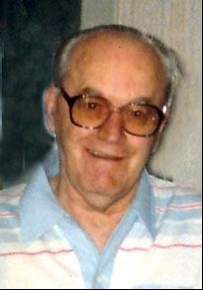 Norman was a life member of the Disabled American Veterans and the Veterans of Foreign Wars (VFW) and also a longtime member of the American Legion and Elks Club. Bud was predeceased by his wife of 64 years, Patricia (Mulcahy) Grimshaw, on July 13 of this year. He is survived by a son, Michael, a daughter, Arlene, and three grandsons, Aaron Grimshaw, David and Daniel Gilligan. A graveside service will be held Friday at 11 a.m. in Evergreen Cemetery in Rutland. Officiating will be Rev. Justin Baker, pastor of Christ the King Church. Arrangements are under the direction of Clifford Funeral Home in Rutland. Contributions may be made to Christ the King debt reduction fund, 66 South Main St., Rutland, VT 05701. Patricia Mary Grimshaw, 93, of Rutland, died Friday, July 13, 2012, at Mountain View Genesis Health Care, following a brief illness. She was born in Rutland December 1, 1918, the daughter of Michael and Bridget (Maloney) Mulcahy. Mrs. Grimshaw was a graduate of Mount St. Joseph Academy, class of 1937. Before her marriage in 1946 to Norman S. Grimshaw, Pat worked as a dental assistant in Astoria, Long Island, N.Y., as well as Rutland. Later, after raising her two children, she embarked on a new and surprising career. She was employed by the Rutland City School Department for 17 years as the school secretary at Longfellow School and as the librarian for Rutland High School. She often spoke fondly of those years and loved the children. The most important part of her life was the love of her family. She was a devoted wife, mother and grandmother. Personality traits that would best describe her would include courage, dignity, gentleness, kindness and funny. Oh, she loved to laugh and the joke was most often at her expense. Many people loved her and she will be dearly missed. Patricia is survived by her husband of 64 years, Norman S. Grimshaw; her daughter, Arlene M. Grimshaw, and a son, H. Michael Grimshaw; and three grandchildren, Aaron Grimshaw, David Gilligan and Daniel Gilligan; a brother, John Mulcahy of Rutland; nieces and nephews. She was predeceased by three sisters, Mary Margaret Scott of Rutland, Rita Crowley of West Grove, Pa., and Theresa Lantier of Hyde Park, Long Island, N.Y.; and by a brother, Raymond M. Mulcahy of Brandon. At Patricia’s request, there are no visiting hours. A Mass of Christian Burial will be celebrated at 11 a.m. on Wednesday, July 18, 2012, at Christ the King Church. Officiating will be Rev. Justin Baker, pastor. Graveside services will be held in Evergreen Cemetery with a reception to follow at Engle Hall in the lower level of the church. Contributions may be made to Christ the King Renovation Fund, 66 South Main St., Rutland, VT 05701. Edward Grimshaw is a seventh generation descendant of a Grimshaw family line in Prestwich, which is located northwest of Manchester. The Prestwich Grimshaw family lines are described on a companionwebpage. However, Edward’s earliest ancestor, James Grimshaw (married Elizabeth Guest) has apparently not yet been connected to other identified Prestwich Grimshaw lines. Edward’s ancestry and descendant chart is shown below with Edward indicated in bold and italic font. |—1George Grimshaw (?  1709, Rooden Lane) & Maria Rollinson (1654, Prestwich 1711, Rooden Lane). Married 30 Oct 1673, St Marys Prestwich. |—|—2 George Grimshaw (1683, Prestwich  1761, Prestwich) & Sarah Wild (? 1750, Hardmans Fold). Married 17 Aug 1725, St Marys Prestwich. |—|—|—3 George Grimshaw (1739, Prestwich  7 Sep 1813, Prestwich) & Lydia Dargyshire (?  bur 29 Nov 1765). Married 19 Feb 1765, St Marys Prestwich. |—|—|—3 George Grimshaw (1739, Prestwich  7 Sep 1813, Prestwich) & Mary Berry (1743  15 Aug 1827, Prestwich). Married 28 Mar 1769, St Marys Prestwich. |—|—|—|—4 Hugh Grimshaw (1786, Prestwich  1836, Prestwich) & Mary Maddocks (1789  1835, Prestwich). Married 17 Jul 1808, St Marys Prestwich. |—|—|—|—|—5 John Grimshaw (26 Jul 1820, Prestwich  1863, Prestwich) & Sarah Walker (1827, Great Heaton  1902, Prestwich). Married 5 Apr 1853, St Marys Prestwich. |—|—|—|—|—|—6 Edward Grimshaw (24 Apr 1857, Prestwich – 27 Dec 1924, Hartford, CT) & Mary Ann Heywood (Oct 1858, England – ?). Married 9 or 13 Oct 1881, Oldham, Lancashire. |—|—|—|—|—|—|—7 Hugh Edward Grimshaw (1882 or 15 Oct 1888, Prestwich – 18 Jul 1947, Rutland, VT) & Frances Gates Stockwell (Nov 1891, Vermont – ?). 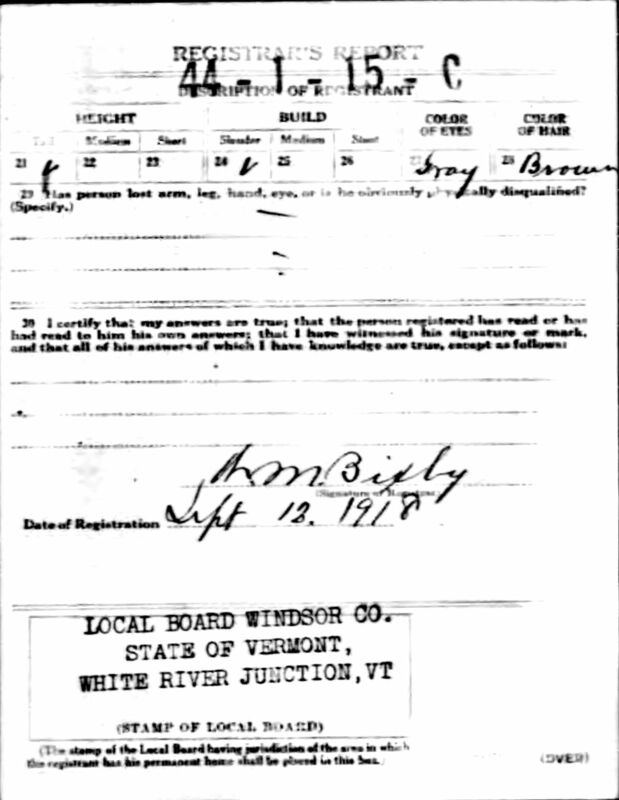 Married 1 Feb 1913, Cavendish, Vermont. |—|—|—|—|—|—|—|—8 Norman Stockwell Grimshaw (5 Mar 1919, Ludlow, VT – 20 Aug 2012, Rutland, VT) & Patricia M Gertisser or Mulcahy. Married 16 Sep 1946, Rutland, VT.